Aerolíneas Argentinas (IATA: AR, ICAO: ARG, and Callsign: Argentina) is Argentina's largest domestic and international airline. It is the national airline and carries around 80% of Argentina's domestic traffic and 40% of international flights from Ministro Pistarini International Airport, which is located in Ezeiza, Buenos Aires. 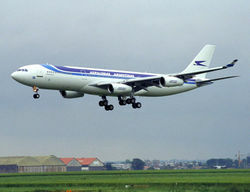 Aerolíneas Argentinas and LAN Airlines are the only Latin American airlines that fly to Oceania. The airline's history can be traced back to the year 1929, when carrier Aeroposta started operations. The Argentine government, recognizing Argentina's vast geographic size and the need for fast transportation links between the countryside and the larger cities, established an airline company to carry passengers and mail. The first two destinations served were Mendoza and Posadas. Frenchmen Jean Mermoz and Antoine de Saint-Exupéry were among the company's first pilots.